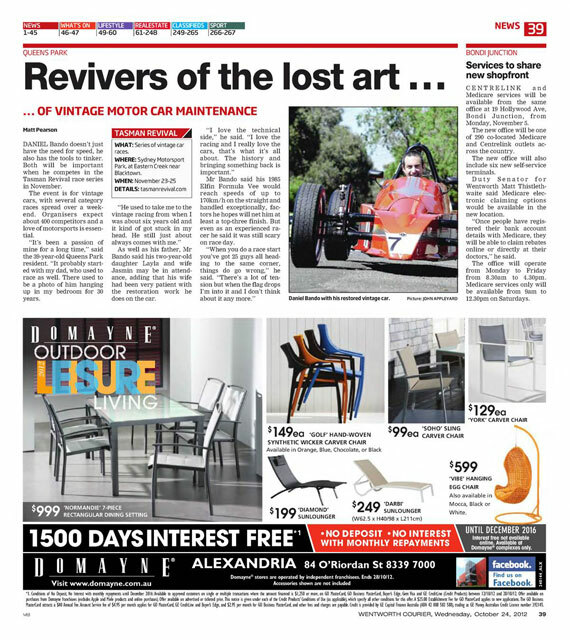 With the 2012 Tasman Revival just a month away, mainstream media is starting to spread the word about historic motorsport and get people excited for the event. Daniel Bando was recently featured in an article in the Wentworth Courier, which you can check out in their online publication here, or in the picture below (click the image to embiggen)! This entry was posted on Friday, October 26th, 2012 at 7:40 am	and is filed under News, Tasman Revival and tagged with 2012, Sydney Motorsport Park. You can follow any responses to this entry through the RSS 2.0 feed.